Another welcome to those just joining us on the blog site for another year of Newsletters! For those new or in need of a refresher, every Monday morning, I will be doing up the weekly Newsletter, after I do my statistical audit for the weekend, ensuring accuracy on a weekly basis and then giving out some weekly nods to those deserving. There were some years where there were some prizes handed out for the weekly nods, but it has been some time since that happened... it might be something worth bringing back again, but that's a discussion for another time. Be sure to catch-up here every week, hopefully there's something here for everyone! It was a blinding start to the season on the scoresheets around the league and Week One finished with three players at 6 points a piece, but only one could take the weekly honour and thanks to scoring 3 goals, the 6-point Player of the Week was Edmonton's Connor McDavid, showing us why he is so popular in so many hockey circles nowadays. McDavid and the Oilers were scheduled and played three games in the opening week, the one busiest NHL teams to start the year, but the superstar dynamo was only able to register points in two of those three games, but it was still enough for the honours. A couple of 3-point games against the Calgary Flames, a goal and 2 assists to open the season at home, then a pair of goals and an assist in Calgary to round everything off. The Buffalo Sabres were able to hold him at bay in the third game of the season, but not everyone will likely be that lucky. Stacey C. was fortunate to receive the 2nd overall pick, despite not being at the draft, but I'm sure, like a few others at the draft, would have believed that McDavid would have been his pick to start the draft, so there is a sense of understanding there. Stacey's team opens the season in a 3-way tie for 2nd place, but his team didn't quite have the goal total to win any tie-breakers, so they start the year in 4th place. This is the first time McDavid earned the hockey pool honour of the Player of the Week... don't think it will be the last time either. It was a rocket of a start for Cam, whose team didn't even have anyone playing on Sunday, but had more than enough points to earn the first Mover & Shaker nod of the season, finishing with a pool-high 24 points and the early lead. Kristy & Don were able to break the curse of the first Mover & Shaker of the year, a couple of seasons ago, as they practically went wire-to-wire with a pool win in the 2015 season. Last year's opening M&S was Ryan and he finished a very respectable 5th. Cam's 24 points was 2 points better than his nearest competitors in the week, which came through after the audit, where there were a few corrections that needed to be made. 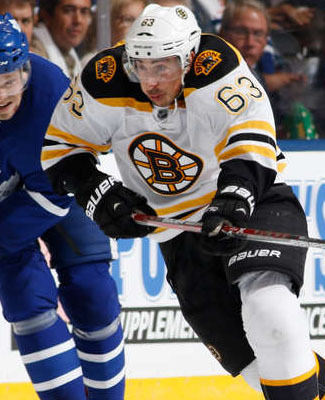 Nevertheless, Brad Marchand, another one of the contenders for Player of the Week, led the way for Cam's team, finishing with 6 points. He was followed up by the best goaltending tandem in the week, with Marc-Andre Fleury and Roberto Luongo each picking up a couple of wins each and finishing with 4 points. After those three, it was a whole lot of depth, as just about everyone picked up a point on Cam's team, except for Brayden Schenn, who is almost finished with a 3-game suspension to start the year and defenseman Justin Braun, who failed to pick up points in the first couple games of the season. This is Cam's second Mover & Shaker of the week nod all-time, back in the 2015 season, he registered his first one in Week Three, and then went on to finish 10th overall in the pool. I don't think that should have much of an effect on his 2017 season, as this gets him off to a pretty good start, he'll just have to hope for the best out of his goaltending combination, as that's what has carried him early on. It was a solid race for getting setup in the basement this week, as a good number of teams were kind of spinning their wheels, picking up the odd point here and there, but couldn't really put the whole week together. In the end, 12 points was enough for the Basement Dweller nod and we had to get through a tie-break to determine our dweller... and with no goals in the opening five days of the season, Dale C. earned his first dweller nod since the 2015 season this week. Dale's forwards were hit with injury and one player was without a contract to start, but things appear to be looking up, as Patrice Bergeron is expected to be back tonight for the Bruins and Rickard Rakell, signed a new deal this week, but still needs the green light from doctors, as he comes back from a botched appendectomy. Dale's team starts Week Two only 12 points back of 1st place, which is double his current score, granted, but not a very big hill to climb, once everyone gets going. It's still very close, top to bottom, and lots can happen between now and the end of the season. Although we didn't get to see the trophy at the draft, I have been assured that it is okay and there is no hostage situation underway. With that being said, our current Mover & Shaker, Cam, has the early look at it, but there's nothing safe about his lead, as his 24 points only leads last place by 12 points and that can be made up with an excellent week, so stay tuned for that. We should have a money announcement in the next day or so, the finances are just about worked out for the pool, web domains being paid and all the expenses done, so we'll know who is getting what really soon. I am expecting to pay down to 3rd place, after the mini-games, and with a 3-way tie for 2nd place, that makes the start of the season interesting. Dale B., Benson and Stacey C. are all vying for the money spots early on, while Grant is only 1 point back and there are another three teams only 2 points back. Thanks to a temper tantrum from Philadelphia's Jakub Voracek, Stuart's team is off to a pugilistic start to the regular season, leading the PIM pool by a fair margin. Voracek had a 22-minute finish to the Flyers' game on Saturday night, getting an unsportsmanlike conduct penalty, a 10-minute misconduct and a game misconduct, after the Coyotes scored the overtime winner in their game. That vaulted Stuart to the top of the table and he finished the opening week with 46 minutes in penalties, which is good for him, since he's in 16th place to start the season. Stuart's nearest competitor is Marcin and Wilton, as they both finished the week with 29 minutes, using the more conventional, minor here, minor there and a major in there somewhere as well. Of course, this mini-game really ramps up after the first Waiver Draft, but between the top three, they are really getting their roots set for this one. Mini-game #2 this season is the goalie survivor pool and one of the toughest weeks to survive is the opening week, especially since everyone may not have the goaltending situation to make it through or they could just be unlucky enough to not have the results go their way. Out of the 25-team pool, 19 teams were able to sneak through to Week Two, while six teams got the early boot. Benson, Dale B., Derek B., Eric, Marcin and Stacey C. were all winless in the week and Benson's team was the only team that didn't really try, registering no appearances from his goaltending tandem of Jimmy Howard or Carey Price. The third mini-game officially gets started next weekend, as the first outdoor game of the year will go in Winnipeg. The Heritage Classic will go between the Winnipeg Jets and the Edmonton Oilers on Sunday and we'll all start collecting points from then on. The most points collected among the four outdoor games will be determined as our winner and you can be sure that we'll have lots of coverage on the blog for that, as we draw closer to each event. Just how good of a start did we have in the first week of the 2017 season? I think the best indicator that we can have is just how many points the pool takes away from the NHL schedule, on average per game. With 25 teams in the pool this season, two less than last season, we opened up the year with an average of 13.4 points per NHL game in the week. Last season, Week One, had one more game and two more pool teams and it only averaged 13.3 points per NHL game, which to me, pales in comparison. Given that we have two less teams in the pool, our average games played from our skaters and minutes collected from the goalies are down, which is understandable, but the scoring is up, if only marginally, but given the numbers, the league is off to a fine start for us poolies! There was also a significant start to the PIM pool as well, as we collected 11.3 minutes per NHL game this week, compared to 9.6 minutes at the same time last year. I think this is all kinds of exciting to start, don't you?